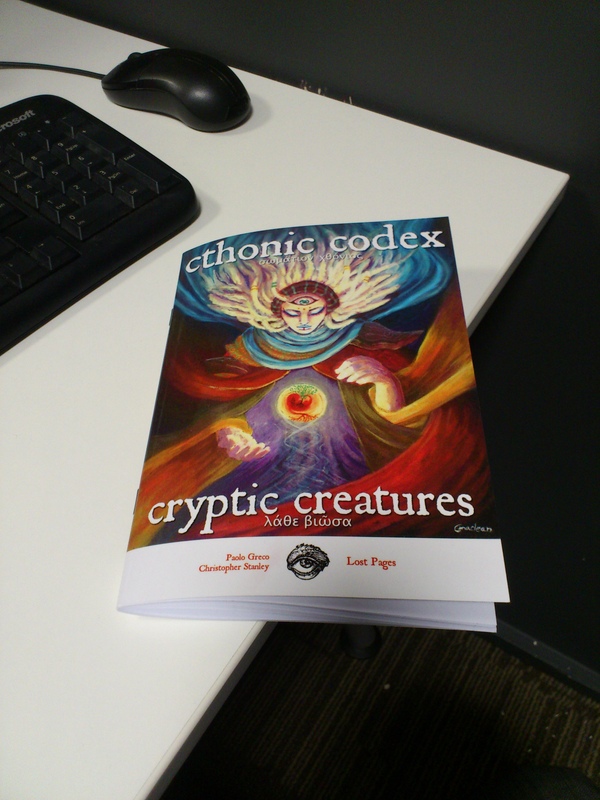 First, Chthonic Codex – volume 1: Cryptic Creatures. It comes in PDF, Print + PDF and three limited editions: Boxed Set + PDF, Codex Edition and Boxed plus Codex Edition. The fancy limited edition will be shipped next year, while the rest should be shipped within the next 2 weeks. It’s the monster manual of the Chthonic Codex setting, as well as being a stand alone monster book for Swords & Wizardry and other retroclones and Adventure Fantasy Game. Second, the Pergamino Barocco, paperback edition! PDF or Print and PDF! This cover might not be final, but it’s going to be reasonably close to the final version. And, last, here’s the new Lost Pages website. I’ll keep all my product information there. 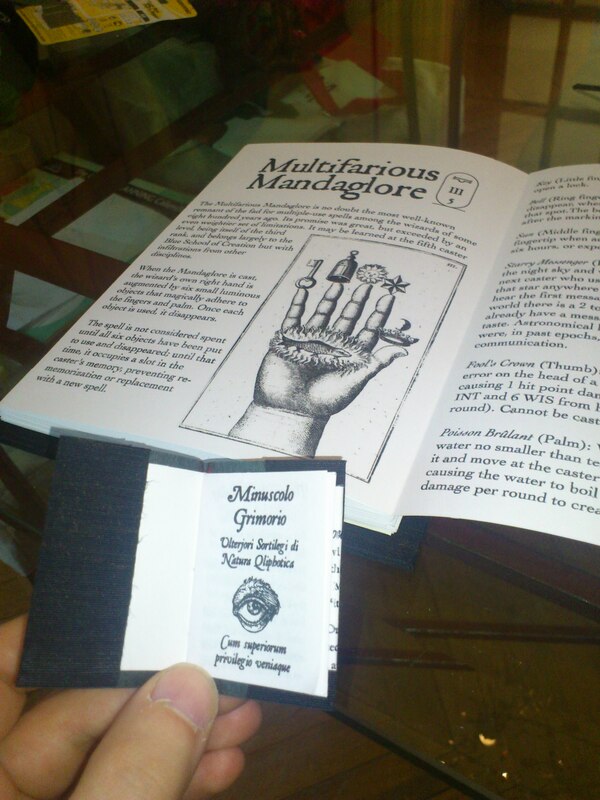 It’s been reported that a customer of Pergamino Barocco found a non-announced, unadvertised tiny spellbook with it. 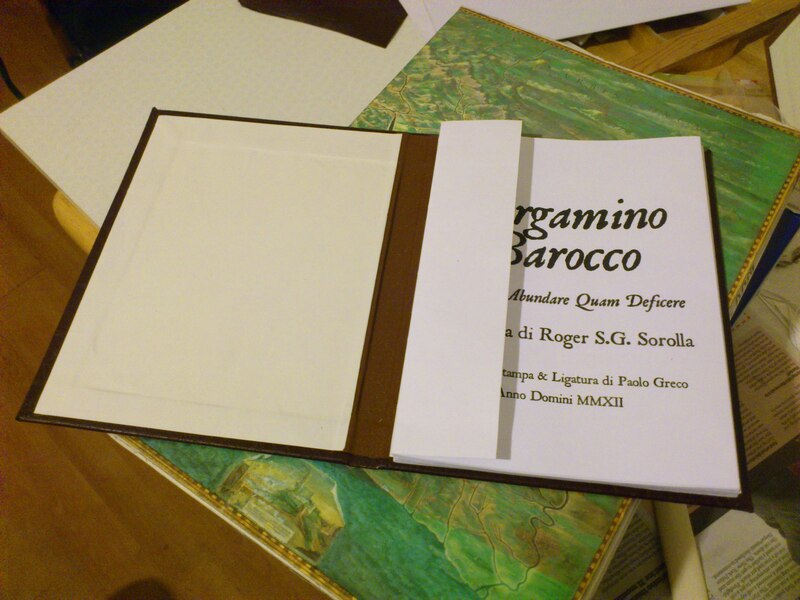 Apparently the book was found hidden in the back of the foam padding we use to protect the Pergamino during shipping. No other customer reported a similar finding to date. The uncredited content is reportedly twelve seemingly otherwise unpublished spells “of qliphotic nature”, whatever that might mean. It must be clear to our readers that neither I nor Roger condone any kind of Left-Hand-Path spells or involvement with the Dark Arts and therefore we take distance from such writing. 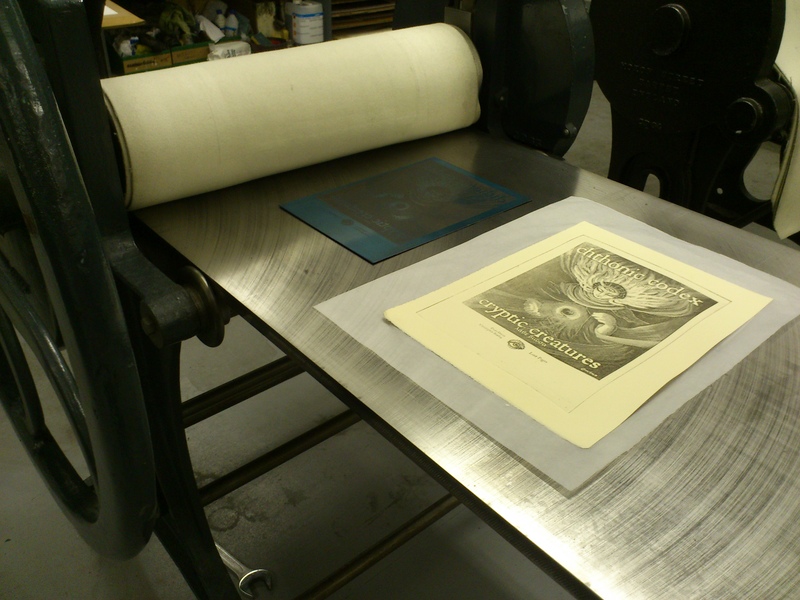 The Pergamini Barocchi have been printed. If all goes well I should be able to ship the first batch next week. Tonight I found some binding leatherette and, well, I wanted to know if the Pergamino would do well with an alternative binding. So instead of the two split hardcovers I’d make a normal book case and attach one of the end of the concertina to it, leaving the other free. Thing is, leatherette hates me. With a passion. It’s a stubborn hateful piece of scorn and I can’t seem to glue it even with a plasma torch. 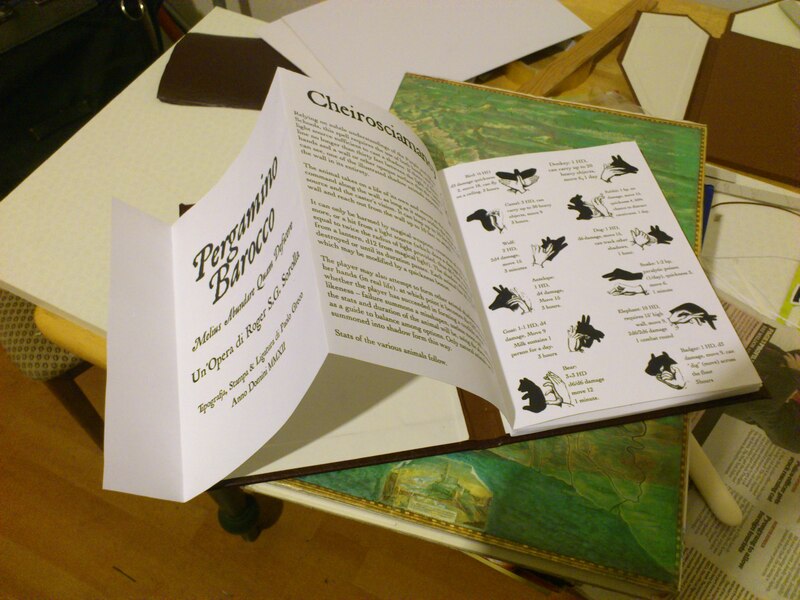 But tonight, kind reader, tonight the leatherette was conquered. Yes, FUN PVA GLUE IS FUN. OH HAI YOU MIGHT BE A SPELLBOOK MAYHAPS? 100% vegan-compatible, non renewable leatherette. Might add some kind of clasp or tie like this braided one. Contents seem to be accessible. MISSION ACCOMPLISHED. By the way, this copy is not really for sale as it has some minor imperfections I’m not really happy with. Small imperfections. 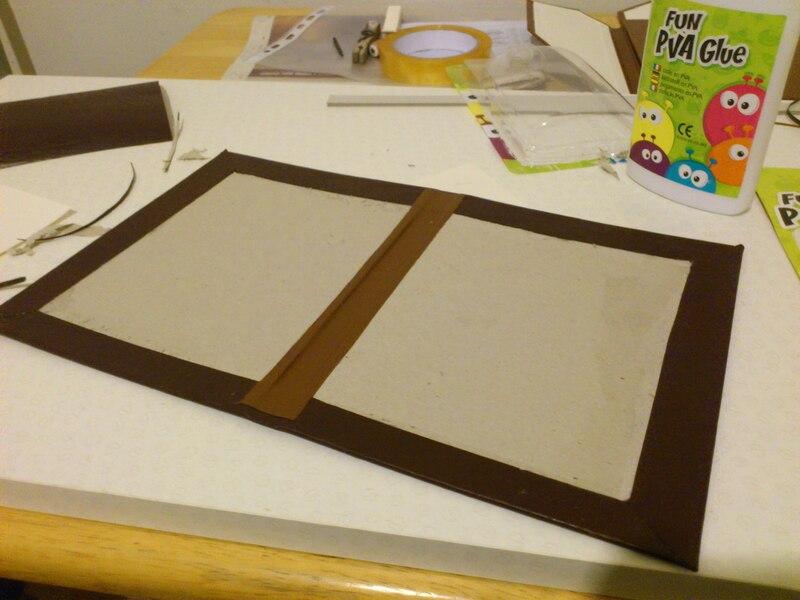 On the other hand I ran out of dark brown leatherette and have only some reddish left, and I REALLY LIKE THE BROWN ONE. But if you do really like it too we can have a chat. Mind you, none of them will be 100% straight and without kinks because I’m just an hobbyist. 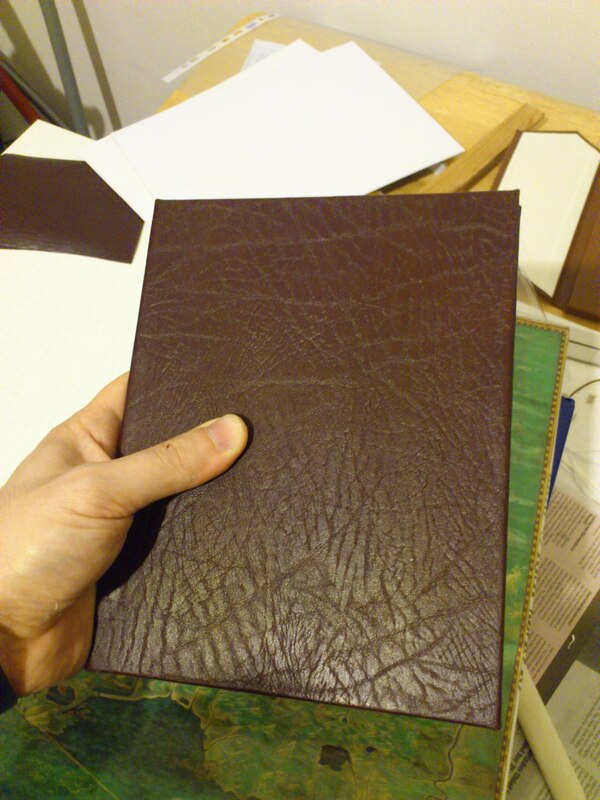 If you have bought a Pergamino already: if you prefer this binding, let me know and I’ll happily oblige. If you have inquired about a Pergamino: you’re part of the waiting list. 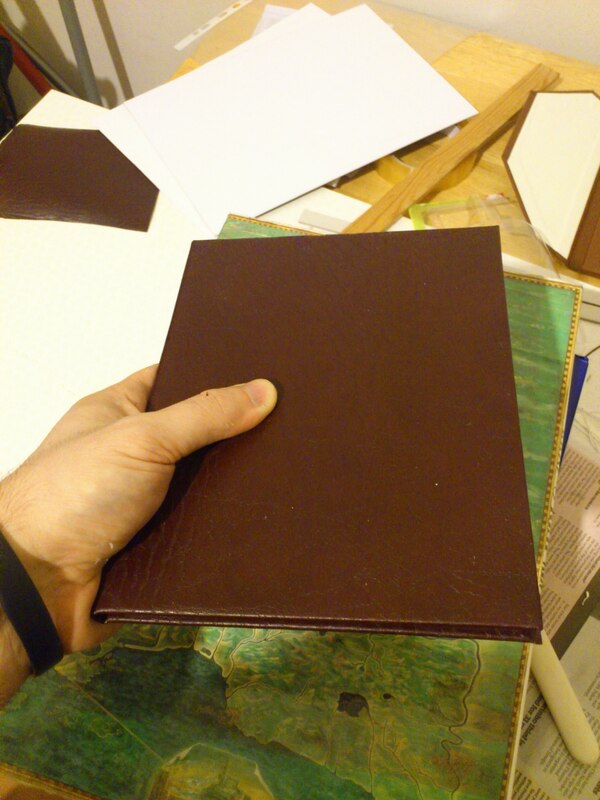 Email me because IT’S BOOKBINDING TIME. This means some kind of transfer of money or food or something so that me and Roger can feel motivated to do more and better. 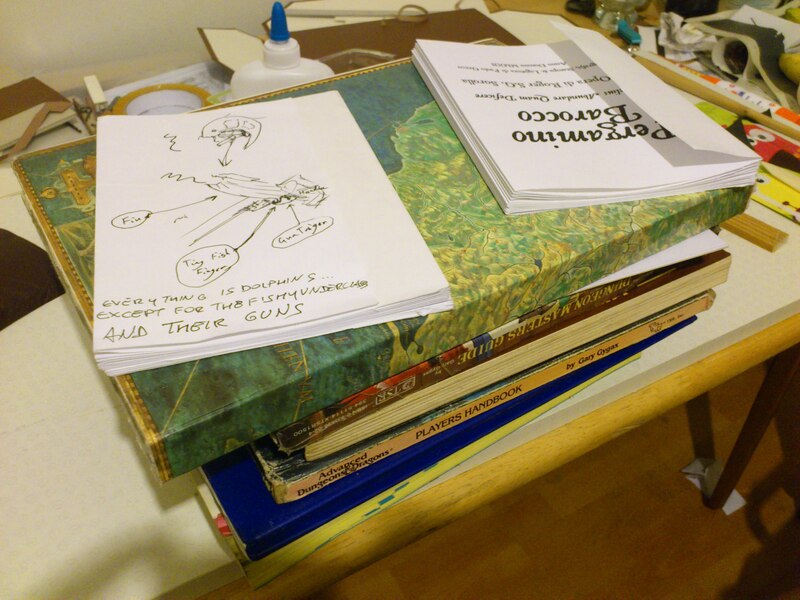 If you have not bought a Pergamino and want one: at the moment I have what can be termed a surplus of scrolls. But it’s not really a surplus because there’s a waiting list. I’m not sure I’m going to print many more because, well, It’s really expensive to make. So, yeah. My email is as per use tsojcanth at gmail. The webstore is here.